This skull was cut out of a styrofoam block, coated in jesmonite, then painted with a pigmented acrylic resin. 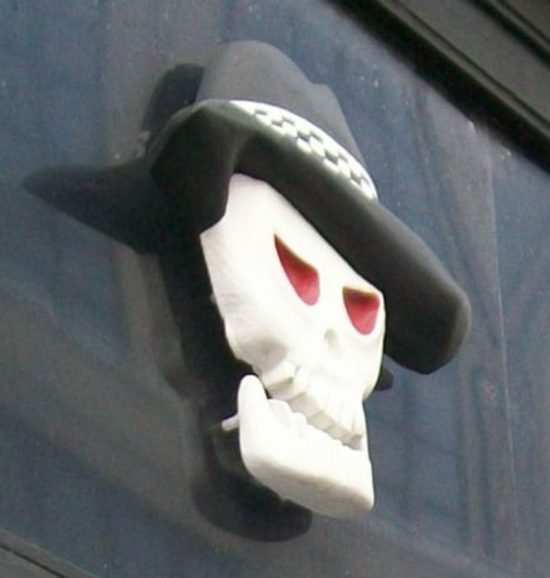 The skull was used for an exterior shop sign The 3D Skull was made from styrofoam, it was 600mm high, 100mm thick, coated with a pigmented acrylic resin, with red matt eyes and white painted face . The skull was lightweight because it was made of styrofoam It was coated in casting resin to make it stronger. Care must be taken when handling. Once in position on the shop sign it will last for years.